Today was the first time I got “the knock” on the door during a peaceful night of camping. Sure, I’ve been checked by deputies a couple of times during the day but had not yet been awakened while camping in the boonies. Today was different… and it turned out to be a pleasant encounter. I wanted to share this information with the readers. Many in the camping/ vandwelling community fear that first unexpected meeting with “Johnnie Law” but it does not need to frightening or confrontational. First, here is where I camped. 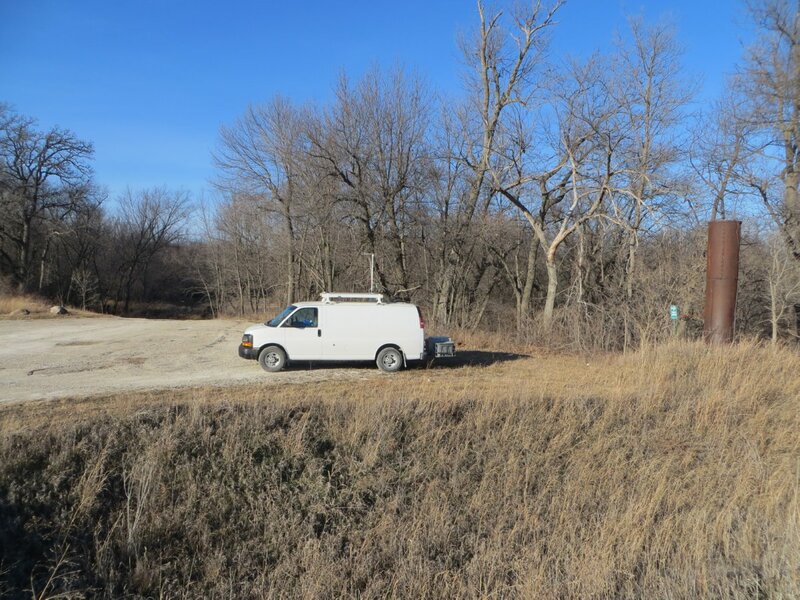 This location is called Otterville, just north of Independence, Iowa. It is a wooded area near where Otter Creek and the Wapsipinicon River meet. The state WMA (wildlife management area) ground is just west of the bridge. The area is open 24 hours a day for hunting, fishing, and even camping. I chose a spot near the road anticipating that passersby would see the TV antenna and know someone was camping. At 4:45 I heard the knock. Startled, I yelled “Hey!” A voice responded with “Sheriff’s department!” I told him I would be right out. I quickly pulled on some clothes and shoes. The officer (who was still outside the van) asked if I was the only occupant and I said yes. He asked my name and I said Bradford. 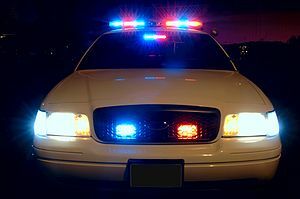 I moved outside slowly with both hands in plain sight, greeting the deputy with a cheerful sounding “Good morning.” A spotlight from his car had the area illuminated. The officer was very friendly and asked why I was here. I told him I was on my way back to Cedar Rapids and had camped for the night. He asked when I arrived and I said about 4:00 PM. My driver’s license was checked and came back as clean (of course!). We also discussed something I saw about 7:00 PM last night – people hunting near the riverbed using headlights on their caps. The officer said people are sometimes looking for coyotes at night. The deputy asked where I worked, where I live, etc. I answered each question truthfully and maintained eye contact. Sure, he was asking detailed questions for a reason but if a person is truthful, there should be nothing to fear. In my mind, the best approach is to be upbeat and cooperative. The sheriff’s deputy was cordial and let me know that I had broken no laws and was welcome to camp there but he did recommend that next time I contact the sheriff’s office in advance. That way if anyone calls in with concerns, the sheriff’s department will know that things are okay. The deputy also said some areas are not open to camping overnight and calling in would avoid that issue. We discussed the TV antenna and the steamed windows – a sure sign that someone was inside. I told him that instead of parking closer to the river and out of sight, I decided to park in full view of the road so law enforcement would know I wasn’t trying to act shady. That seemed to be well received. I cannot blame law enforcement for being curious… or some of the people passing through on the road next to me. Iowa has had its fair share of child abductions and meth labs and, sadly, some of them have involved white cargo vans. People are a little edgy these days. I liked the deputy’s recommendation. It had never occurred to me to call and speak with the sheriff’s office prior to camping. There’s still no reason to call when in organized campgrounds but in the small wildlife management areas, it makes sense. So everything turned out just fine. The sheriff’s deputy was an excellent ambassador of goodwill and I hope he found that this camper was equally friendly. I plan to do more primitive camping on state WMA lands because they are wonderful resources and are FREE. They are also usually convenient to some great fishing streams. Have fun, stay safe, and please be respectful if your local constable comes knocking. His approach with you might be influenced by the camping enthusiast before you. If you leave him with a positive impression, the next person camping in the boonies might benefit. You did well. I thought he was gonna bust you for taking that shower.